The middle ear is located behind the eardrum. An infection can enter this area and cause swelling and pain. Most middle ear infections are caused by viruses. Others may be caused by a bacteria. Most ear infections develop after a cold or flu. 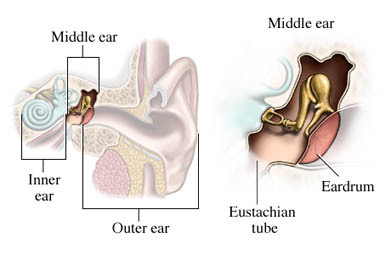 A tube called the eustachian tube runs from the middle ear to the back of the throat. If you have a cold or flu the infection can pass from the throat, through the tubes and up to the ears. The doctor will ask about symptoms and medical history. A physical exam will be done. Most middle ear infections can be diagnosed by looking into the ear with a lighted instrument called an otoscope. The doctor will see if there is fluid or pus behind the eardrum. A small tube and bulb may be attached to the otoscope. This is to blow a light puff of air into the ear. The puff helps the doctor see if the eardrum is moving normally. The doctor may choose to wait and see, since most ear infections will pass on their own within 2-3 days. During this time period, medications will not be prescribed. Infections that are severe, last longer than expected, or occur in children 6 months and under may need more treatment. Antibiotics are not often needed. They are used for severe infections caused by bacteria. Mild infections caused by bacteria can pass on its own without antibiotics. Using antibiotics when not needed can actually make you more ill, than letting the infection pass on its own. Note: Decongestants and antihistamines are not recommended to treat ear infections. A myringotomy may be done to drain fluid from the inner ear. A tiny cut is made in the eardrum to drain fluid and pus. An ear tube may also be placed to let fluids continue to drain. Breastfeed your baby for at least the first 6 months of life. Try to avoid giving your baby a pacifier. If you bottle-feed, keep your baby's head propped up as much as possible. Don't leave a bottle in the crib with your baby. Get tested for allergies if you or your child have chronic nasal congestion. Keep allergy symptoms well controlled. Treat related conditions, such as GERD. Practice good hand washing hygiene. Make sure your child's vaccinations are up to date. Consider getting a flu vaccine . Pneumococcal vaccine may prevent some ear infections, but the overall effect on ear infections is not known. If your child has a history of ear infections, talk to the doctor about long-term antibiotic use. Ask your doctor about tympanostomy tubes. These tubes help equalize pressure behind the eardrum and prevent fluid build-up and infection. Acute otitis media (AOM). EBSCO DynaMed Plus website. Available at: https://www.dynamed.com/topics/dmp~AN~T116345/Acute-otitis-media-AOM . Updated May 17, 2016. Accessed September 25, 2017. Hurst DS, Amin K, Seveus L, Venge P. Evidence of mast cell activity in the middle ears of children with otitis media with effusion. Laryngoscope. 1999;109(3):471-477. Ear infections in children. National Institute on Deafness and Other Communication Disorders (NIDCD) website. Available at: http://www.nidcd.nih.gov/health/hearing/pages/earinfections.aspx. Updated May 12, 2017. Accessed September 25, 2017. 10/12/2006 DynaMed Plus Systematic Literature Surveillance https://www.dynamed.com/topics/dmp~AN~T116345/Acute-otitis-media-AOM : Spiro DM, Tay KY, Arnold DH, Dziura JD, Baker MD, Shapiro ED. Wait-and-see prescription for the treatment of acute otitis media: a randomized controlled trial. JAMA. 2006;296(10):1235-1241. 9/23/2008 DynaMed Plus Systematic Literature Surveillance https://www.dynamed.com/topics/dmp~AN~T116345/Acute-otitis-media-AOM : Coleman C, Moore M. Decongestants and antihistamines for acute otitis media in children. Cochrane Database of Syst Rev. 2008;(3):CD001727. 6/5/2009 DynaMed Plus Systematic Literature Surveillance https://www.dynamed.com/topics/dmp~AN~T116345/Acute-otitis-media-AOM : Foxlee R, Johansson A, Wejfalk J, Dawkins J, Dooley L, Del Mar C. Topical analgesia for acute otitis media. Cochrane Database Syst Rev. 2009;(2):CD005657. 7/21/2009 DynaMed Plus Systematic Literature Surveillance https://www.dynamed.com/topics/dmp~AN~T909558/Pneumococcal-vaccination : Pavia M, Bianco A, Nobile CG, Marinelli P, Angelillo IF. Efficacy of pneumococcal vaccination in children younger than 24 months: a meta-analysis. Pediatrics. 2009;123(6):e1103-e1110. 11/30/2010 DynaMed Plus Systematic Literature Surveillance https://www.dynamed.com/topics/dmp~AN~T116345/Acute-otitis-media-AOM : Coker TR, Chan LS, Newberry SJ, et al. Diagnosis, microbial epidemiology, and antibiotic treatment of acute otitis media in children: a systematic review. JAMA. 2010;304(19):2161-2169. 12/16/2011 DynaMed Plus Systematic Literature Surveillance https://www.dynamed.com/topics/dmp~AN~T116345/Acute-otitis-media-AOM : Azarpazhooh A, Limeback H, Lawrence HP, Shah PS. Xylitol for preventing acute otitis media in children up to 12 years of age. Cochrane Database Syst Rev. 2011;11:CD007095. 3/31/2014 DynaMed Plus Systematic Literature Surveillance https://www.dynamed.com/topics/dmp~AN~T116345/Acute-otitis-media-AOM : Vernacchio L, Corwin MJ, Vezina RM, et al. Xylitol syrup for the prevention of acute otitis media. Pediatrics. 2014;133(2):289-295.